Published Jan 21, 2016 by Pearson IT Certification. Part of the LiveLessons series. More than 4 hours of video training detailing common exam traps, pitfalls, and difficulties. The author also walks you through a complete practice exam in real time, so you can experience what it’s like to take the test before you ever walk into the testing facility. Red Hat Certified System Administrator (RHCSA) Exam Prep Workshop contains more than 4 hours of deep-dive training on common RHCSA exam traps, pitfalls, and difficulties. 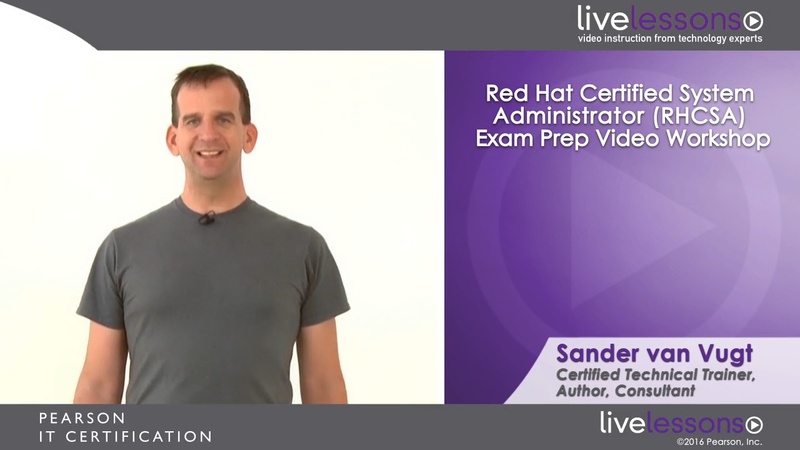 Sander van Vugt, an experienced Red Hat instructor, trainer, and author will detail the most common mistakes people make when taking the exam, so you can avoid them in the testing facility. You will then walk through a live practice exam with the author in real time, so you can experience first-hand what it’s like to take the test. The videos consist of live trainer discussions, CLI presentations and demos, and a real-time practice exam walk-through. You will also learn about the structure of the exam, what to do when you’re stuck, how to approach questions and track time, and more. You can find comprehensive coverage of the RHCSA exam in the Red Hat Certified System Administrator (RHCSA) Complete Video Course and the Red Hat RHCSA/RHCE 7 Cert Guide, both available for Pearson IT Certification. The ideal target student has some preliminary Linux knowledge already, because this course focuses on Linux administration rather than on basic Linux usage. Streaming—Watch instantly as the video streams online in real time; after purchase, simply click Watch Now to get started. Download—Download video files for offline viewing anytime, anywhere; after purchase, simply click the Download icon within the player and follow the prompts. In this module, you'll learn what to expect for the RHCSA exam and how to prepare for it in the best possible way. You'll learn about test-taking techniques, how to manage your time, what to do when you’re stuck, and more. In this module, some of the most difficult topics from the RHCSA exam objectives are discussed. You'll learn about the common problems and how to make sure you perform well on these. This module uses real CLI examples, so you can see what it’s like to overcome testing obstacles on the exam. After getting all the information you need about the different topics, this module will walk you through a live practice exam. This will teach you how to best approach the different assignments, and during the walk-through, you'll see how some smart solutions can be applied to maximize your chances of passing!